1st Annual Messenger Run a Success! On June 13, 2015, SOAHAC, members of the seven surrounding First Nations, and partnering indigenous health agencies, held their first annual 5k Messenger Run/Walk in support of Healthy Active Lifestyles for First Nations Communities in Southwest Ontario. Approximately 100 runners and walkers, including young, old and families, attended the event at the Ska-nah-doht Longwoods Conservation Area. We are especially grateful to Dreamcatcher Charitable Foundation for their financial support that helped make the event successful. The 5k Messenger Run/Walk was created as a way to raise awareness of poor health status in First Nations communities in Southwest Ontario, and to improve health by promoting knowledge and healthy, active lifestyles. Across Canada, there are significant health disparities between Indigenous peoples and non-Indigenous people. Many First Nations are combating high rates of suicide, diabetes, obesity, addiction and HIV/AIDS as a result of the socio-economic effects of colonialism. The event is named after the historical ‘messenger’ of Aboriginal communities living in the region, whose traditional role was to scout for danger and run back to the community to warn them. We hope to continue to spread awareness about different health issues in future years. As an annual event, communities in the area will choose a health issue that is important to them. This year, we focused on HIV/AIDS. Next year, the focus may be on diabetes or suicide. Either way, the Messenger Run/Walk will continue to inform and ‘warn’ the people by raising awareness of health concerns and inequities in Aboriginal communities. Planning for the 2nd Annual Messenger Run 2016 is underway. This year’s event supported the awareness and prevention of HIV/AIDS among the Aboriginal population. All proceeds went to Ontario Aboriginal HIV/AIDS Strategy (OAHAS) in support of this cause. SOAHAC Dietitian and lead organizer Nikki George is hoping the run will foster awareness and connection between participants and health services at OAHAS, SOAHAC, Atlohsa, N’Amerind and Healthy Weights Connection. 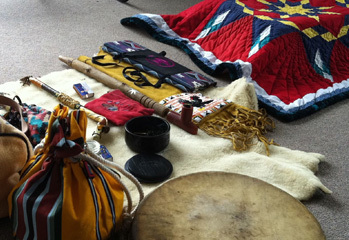 OAHAS provides information, services and programs to Aboriginal people living with and affected by HIV/AIDS. Regional Outreach/Support Services workers are available to Aboriginal individuals and communities, schools, and other service organizations and agencies for HIV/AIDS workshops and information sessions, healthy sexuality workshops, as well as individual counselling and referrals. Services are free, confidential and people-centred. Traditional values of respect, kindness, sharing and caring are universally imparted throughout all activities and we incorporate traditional teachings and values into our programs and services. OAHAS believes in a harm reduction philosophy that seeks to avoid further harm to individuals who may be using drugs or alcohol by teaching people how to be safer in all of their activities.